I had once been directly involved with the development team for an automotive market software product. 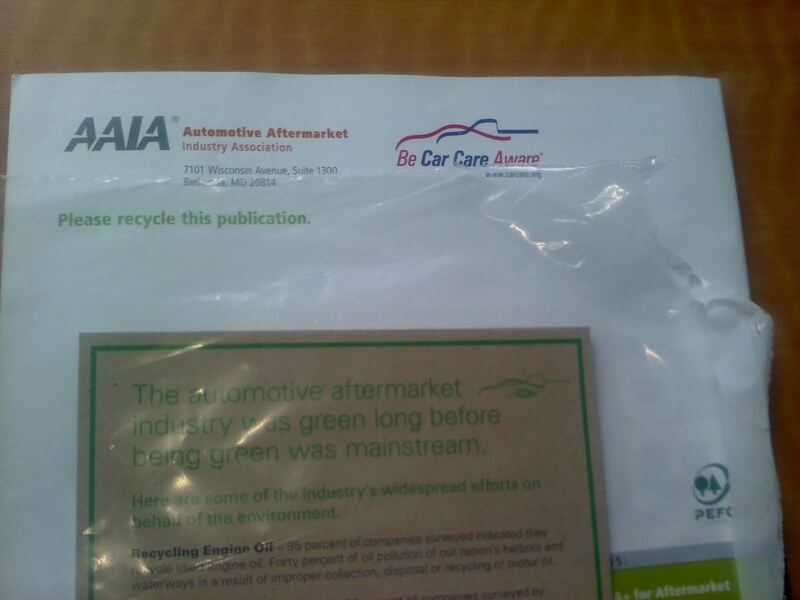 As a result, I worked with resources from the Automotive Aftermarket Industry Association and ended up on their mailing list for their publication: "Aftermarket Insider" which I receive monthly. Volume 70 arrived recently. I noticed, as often happens with periodical advertising supplements, that the issue was wrapped in a plastic sleeve containing a loose insert along with the primary publication. I thought nothing of it until I noticed the content of the insert. It was very nice, recycled card stock with a printed gloat about how "The automotive aftermarket industry was green long before being green was mainstream." Really? You tell me this by including it on unnecessarily thick paper enshrouded in plastic?